What does it take for a wife, mom of three and first generation college student to achieve a bachelor’s? One might say expert juggling skills. But more than that is dogged motivation, undeniable strength and relentless passion for achieving dreams and influencing others. 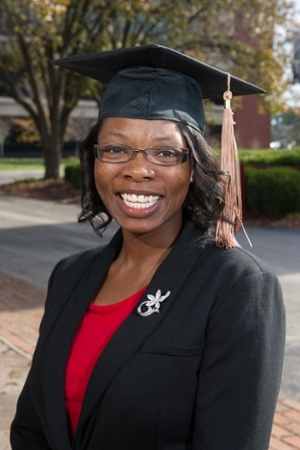 At Southern Illinois University Edwardsville’s Dec. 18 commencement ceremony, Brandi Jackson, a woman possessing all these attributes, will move her tassel from right to left and celebrate the completion of a bachelor’s in accounting from the SIUE School of Business. “My parents instilled in me a strong work ethic and the importance of having a degree, so that my siblings and I could have opportunities in life,” Jackson said. The former stay-at-home mom says she relied heavily on the strength and support of her husband, Joseph, extended family and friends to help her through her studies. As a student speaker during the 9 a.m. commencement ceremony, Jackson intends to applaud her fellow graduates’ success, talk about transformative lessons learned while at SIUE and share in the excitement of the bright futures awaiting them all. “Being a non-traditional student, by age and responsibilities, it took my peers embracing me to help me realize that it’s a difference that I should be proud of,” Jackson said. “My experience brought something different to group projects, like being able to organize assignments and conflicting schedules. She also plans to share with students the invaluable advice she received from an accounting instructor. It was advice that served as her inspiration to pursue accounting. Both inside and out of the classroom, Jackson treasured the encouragement she received from faculty. In January, Jackson will begin an internship at Grant Thornton, a public accounting firm in St. Louis. She also plans to study for the CPA exam and enter graduate school. Ultimately, she says, she would like to become a professor. “I’ve been inspired by my professors at SIUE to become a professor myself,” Jackson said. “I enjoy teaching, and I’ve found that it’s a strength a lot of my peers have made me aware of. 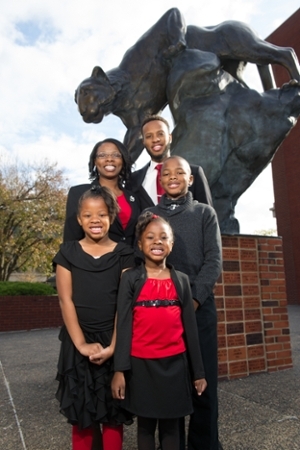 Brandi Jackson shares in the excitement of her achievement with her husband and three children.